A man who's been playing the same game of Civilization 2 for the past ten years is now looking for help. 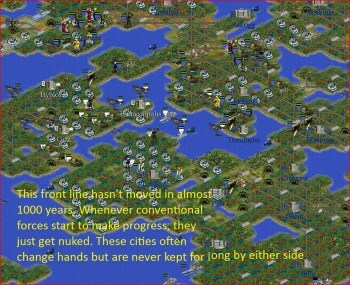 What happens when you spend a decade of your life playing one single game of the masterful strategy title Civilization 2? Nothing good, as it turns out, at least not for the virtual citizens of your world. A reddit user by the name of Lycerius posted his ten-year tale of woe earlier today, describing his world in the year 3991 A.D. as "a hellish nightmare of suffering and devastation." At this point in history, only three super-nations remain - the Vikings, the Americans and the Celts, played by Lycerius. For the past 1700 years, they've been locked in warfare over the planet's few remaining resources that's gone nuclear numerous times, which has in turn caused the polar ice caps to melt more than 20 times, leaving all parts of the world that aren't mountains a useless morass of swamps. Most of the population has been killed off by war or starvation, as global warming has ruined arable land and caused sweeping famines; big cities no longer exist, and what resources remain are constantly poured into the military, just to maintain the stalemate. There's more than that and none of it good, but despite the "air-tight stalemate," Lycerius said his goal over the next few years - real-time, presumably, and not game time - is to end the war and rebuild the world. The obvious problem is that after nearly two millennia of total war, he has no idea how, so he took his problem to reddit. And reddit, to its credit, responded. Users have posted several long-term strategies that may prove effective and have even credit a subreddit, "The Eternal War," in which to ponder the problem. There is fanfic, of course, and a plan for Lycerius to upload his current savegame later today to allow the rest of the world to take a crack at bringing the hostilities to an end. And what started his descent into this most awesome game of Civilization ever? "I grew fascinated with this particular game because by the time Civ III was released, I was already well into the distant future," he explained. "I then thought that it might be interesting to see just how far into the future I could get and see what the ramifications would be. Naturally I play other games and have a life, but I often return to this game when I'm not doing anything and carry on." Even if you don't particularly care about Civilization, it's a fun, fascinating and well-told story - and if you are a fan, you might even be able to save the world. Either way, this is probably the most interesting thing you'll read all day.